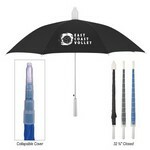 The 46" Umbrella with Collapsible Cover serves as a pleasant reminder of your company’s service, rain or shine. It also folds down with a cover so you don’t have to worry about storing a wet umbrella! The 48″ Auto Open Stick Umbrella features a durable 10mm steel shaft and a straight wooden handle that survives powerful updrafts. 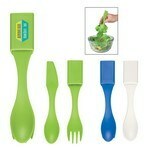 The 4-In-1 Biggie Utensil Set combines together all the utensils you need, for use in the kitchen or at the table. It includes an oversized spoon/knife combo and a fork. The 4-In-1 Mini Nail File is compact, useful, economical, and pleasant to look at. It contains a nail file and buffer. Meet almost all your writing requirements with the 4-In-1 Writing Set. It consists of a mechanical pencil, a yellow highlighter, and 2 pens. Make your tech savvy customers and employees happy by giving them the 4-Port Round USB Hub. 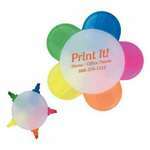 Imprint your company’s logo on the hub, to gain extensive brand visibility. Look well groomed all the time, with the 5 Piece PU Leather Look Manicure Set at your disposal. 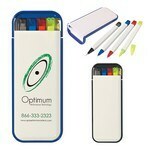 Imprint your company’s logo on the manicure set to maximize brand exposure. The 5” X 7”Aluminum Photo Frame plays the role of a fond friend, on a busy day at office, by reminding you of cherished memories. Imprint your business logo on this classy aluminum frame and ensure your brand’s prominence over the others in the recipients’ minds. Bring alive your thoughts, musings, and ideas by noting them in the 5" X 7" Journal Notebook and save a permanent reminder of them. It features an 80 page lined notebook with a PVC cover. 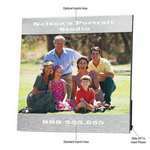 The 5” X 7”photo Frame will add a personal touch to your work station, while advertising your brand as a caring one. Imprint your business logo on this classy aluminum frame and ensure that your brand gains prominence over the others in the recipients’ minds. 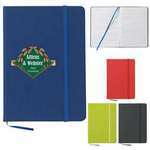 The 5" X 7" Spiral Notebook has a unique design that offers a prominent surface area, to imprint your logo and spread brand awareness. It features an 80 page lined notebook with flaps.